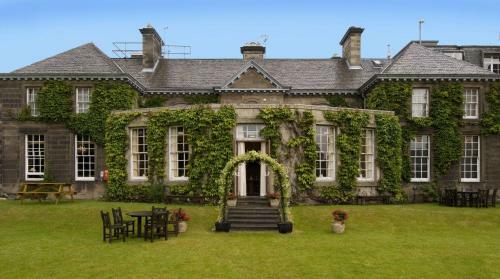 Set in an Edwardian country house, Ellersly House Hotel features an award-winning restaurant and a whiskey bar. The hotel is situated in Murrayfield, just a 15-minute drive from Edinburgh Airport. The bright and airy bedrooms each have a private modern bathroom with a hairdryer and free toiletries. All rooms feature a flat-screen TV, a trouser press and tea/coffee facilities. Free Wi-Fi and afternoon teas are available in the elegant lounge. Guests can enjoy a creative Scottish menu in the restaurant, featuring quality local produce and herbs from the kitchen garden. Surrounded by secluded gardens, Ellersly House is a 10-minute walk from the Murrayfield Stadium. There is free on-site parking, and Edinburgh’s historic centre is just 2 miles away.